Paragliding course is for everyone who wants to be a pilot and fly. At the same time it is a great way of active holiday and opportunity to get new view of life. In these courses you will easily and comfortably learn theoretical and practical knowledge which is necessary to fly safely. Why to fly with ADZ-FLY? ADZ-FLY – is safety and quality. In our paragliding school we use most modern training paragliders AXIS Compact II, very good AXIS Bravo harnesses with airbag and rescue parachute, too. Our instructors are Slovak paragliding and powered paragliding top pilots. We are looking forward to fly with you! One day introduction paragliding course as well as tandem flight are dedicated to introduction with paragliding. 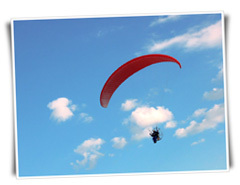 During this course you will learn theoretical and practical basis of paragliding. You will be able to take off, fly shortly and land safely from the small hill. This course is mostly dedicated to people who are very busy and to those of you who don’t like compromises. The content of an individual course is the same as basic paragliding course. Exclusiveness of this course is in individual attitude between student and instructor and in full service provided to you. We will fully respect your time needs. This allows flexible training to suit you!